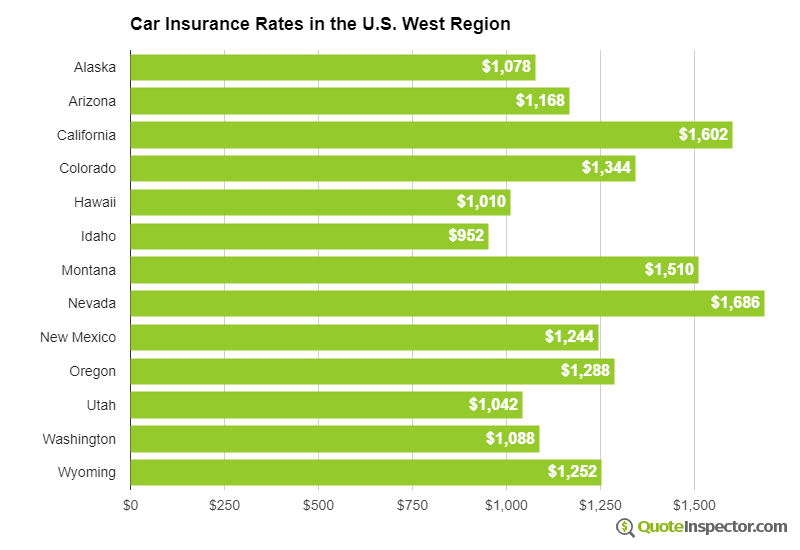 How much does car insurance cost where you live? Select your state and get detailed rate data including rate estimates by coverage, rates for different deductibles and liability limits, rates by city, rates by make and model, and more. The rate comparison charts below are broken down by U.S. geographic region, with states grouped into Northeast, South, Midwest, and West regions. Rate estimates are figured for a 40-year-old driver driving an average passenger car, full coverage with $500 deductibles, and a clean driving record. Additional premiums and risk profiles can be found in the table following the charts. 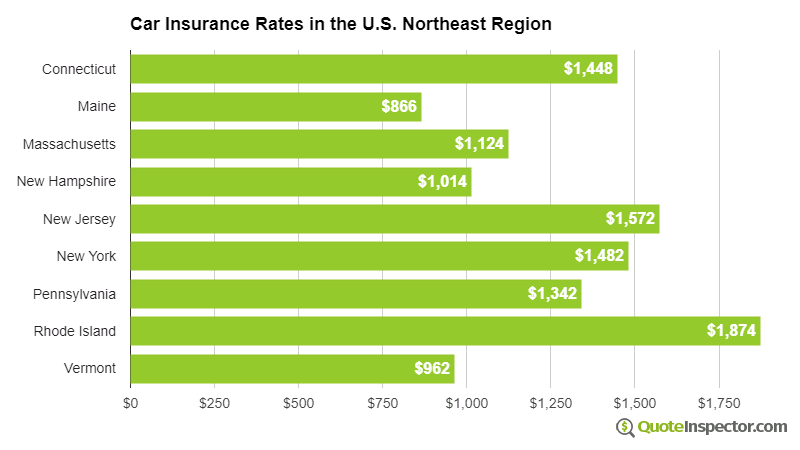 The table below shows how different policy deductibles can impact the price of car insurance in each state, as well as how your age and driving habits can increase prices. The average rate uses $500 deductibles for comprehensive and collision insurance, the high deductible rates use $1,000 deductibles, and the low deductible rates use $100 deductibles. The high risk driver rates are for a middle-aged driver with multiple violations and an at-fault accident. The teen driver rates are for a 16-year-old driver. Click on any state to get detailed rate information including comparisons by vehicle make and model, breakdown by coverage type, liability-ony rates, and rates by cities in each state. Why Do Car Insurance Prices Vary So Much? Each state has their own insurance laws, and some handle claims differently than others. Some states are considered 'no-fault' states, which means your car insurance company will pay your claims regardless of who is at-fault in the accident. No-fault states require you to purchase PIP or Personal Injury Protection coverage, and you have limited rights to sue the other driver. No-fault states tend to have higher car insurance rates, and Michigan particularly has high rates because their laws currently require insurers to cover lifetime treatment for injuries sustained in an accident. Another reason rates may be higher in one state than another is due to mother nature. States that have high incidents of hail, flooding, or other naturally occurring destructive weather will have more claims. Claims are paid by every policyholder, so the more claims a company has, the higher rates will rise to ensure their profitability. A third cause of rate variability can be blamed on traffic congestion in urban areas. With more people driving on the highway, more accidents are bound to happen. 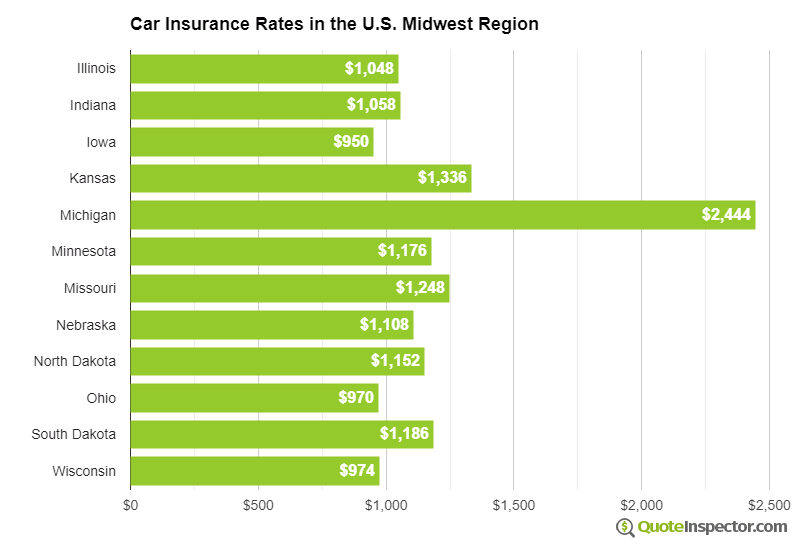 Car insurance rates in large cities generally costs more than in sparsely populated areas. The last rate factor that we will talk about can cause rates to rise just by living in a certain area of a city. Areas that have high auto theft rates, vandalism, or high incidents of insurance fraud will have higher auto insurance rates. Insurers can charge more just based on your address or zip code, and they do a lot of data mining to determine which areas are more likely to have higher claim rates. So if you live in an area that has been determined to have an abnormally high number of claims, chances are good that you'll be paying more for your policy.